When I initially reviewed Gareth Evans’ The Raid back in 2011, I found myself split between utter awe and exhilaration at the film’s action sequences and fight choreography, and general indifference (if not outright confusion) towards the film’s plot and characters. Subsequent viewings have since adjusted my opinion, with my respect and admiration towards the action side of things increasing (the more one picks apart Evans’ construction of each set-piece, the more one marvels at how the man pulled off such remarkable feats), and my understanding of the film’s narrative approach coming into sharper focus. I still think the original film’s narrative is more about crafting the perfect set-up for an action film than it is about telling an interesting story, but there is such extreme tension inherent to the premise, and such a sly, understated development of character from fight to fight and floor to floor, that I’ve come to believe the film does have a surprisingly effective level of cumulative impact. It is perhaps the most perfectly simple action movie ever made, but it is also one you wind up investing in, especially on multiple viewings. Yet as good and refreshing as the original Raid is, it winds up feeling like little more than an appetizer to the main event, for The Raid 2 is an extremely different – and wholly superior – beast in nearly every way imaginable. From the opening shot – a frame more compositionally rich and suggestive than any given frame in the original film – The Raid 2 has an ambition, style, voice, and sense of thematic, narrative direction that the original Raid – intentionally, as a function of its limited premise – just didn’t have, and what is most amazing to me is that Evans and company have pulled off this major transformation so completely. Going from exceedingly simple but wholly viscerally effective action film to thoughtful, atmospheric crime saga – with even more viscerally effective action sequences on top – should not, hypothetically, work, or at least not as smoothly as it does here. The gaps in ambition and intent between the two films are cavernous, and I think some fans of the original are going to feel isolated and turned off as a result. This is absolutely not an empty action film one sits down to watch with one’s brain switched off, and anyone going into it with that mindset is going to come out frustrated. That is exactly what I love about the movie, though, and while I am still sorting out my overall thoughts on The Raid 2, I think the fact that the more I ponder it – the more mental energy I expend engaging with the story, characters, themes, and overall direction of the piece – the more I respect, admire, and feel exhilarated by the film speaks volumes. It will take multiple viewings for me to fully wrap my head around what Evans and company have crafted, but I can definitively say that this is an impressive, remarkable achievement, and not at all what I expected going in. Rather than a simple, confined, direct story like the original Raid, The Raid 2 is a sweeping crime narrative, with protagonist Rama forced to go undercover in an organized crime family in an attempt to root out the corruption that led to the events in the first film, and which now threatens the safety of his family. It’s a situation that demands Rama rely on wit, patience, and endurance as much as physical strength, and as a result, the overall pace and tone are entirely different. Where The Raid was all forward momentum all the time, breathlessly paced to the point of exhaustion, The Raid 2 is the slowest of slow burns, absolutely methodical in how it builds each scene and allows every conversation or maneuver to play out, letting images just rest and sink in before doing anything with them. The entire film is just oozing atmosphere, an all-consuming, absolutely stifling sense of moral and emotional erosion that extends from the writing to the production design (the sets are magnificently constructed exercises in minimalism) to the lighting to the cinematography to the music to the performances. Gone is the experiential, gritty, shaky-cam photography of the original, replaced with big widescreen compositions that submerge us in the atmosphere and setting, and which are positively dripping with dread, anxiety, and fury. This world feels dirty and dangerous, positively soul-crushing in its utter corruption on all levels, and we know what Rama feels because we sense it to, just as a byproduct of being so effectively immersed in his story. The narrative, too, takes its time to build. Evans isn’t paying lip-service to the undercover cop genre – he is making a genuine, no-hold-barred entry in the canon, one that explores the machinations of crime syndicates and destructive pressure on undercover agents to the same degree as Infernal Affairs or The Departed. While I am still not sure how every piece of the story fits together, I think it’s a major testament to Evans’ writing that I never once felt bored or disengaged, no matter how obscure or opaque certain scenes felt on a narrative level. Every single sequence feels like it is building towards something, laying further foundation on everything that has come before, and as a result, it’s the kind of movie where trying to pass any sort of judgment moment to moment is impossible. The feeling throughout is that this is all going somewhere, building to some major narrative or thematic breakthrough, and we are along for the ride as the tracks are slowly, meticulously laid, kept partially in the dark until the final route starts to come into focus. That kind of structure, of constantly delayed narrative and thematic pay-off, can be frustrating, but The Raid 2 makes it riveting, not only because each and every scene is expertly executed on all levels, but because the more narrative we crawl our way through, the more one feels the walls are closing in, and the more we want to see how Rama and the other characters react when the pressure reaches its breaking point. The film ends at the absolute perfect moment, and the entire final act is a beautiful, grisly, horrifying, and remarkably thought-provoking exercise in pay-off, absolutely informed and empowered by the slow-burn of the first two hours. It turns out Evans absolutely has something to say here about the penetration of corruption in Indonesian society, about how blurred the lines become between cop and criminal until such lines don’t even matter any more, and about what happens to someone like Rama who spends his life straddling those illusory distinctions. It is a powerfully seething bit of emotional, ethical frustration, baked into every last action beat of the final act, and which comes to the forefront in the film’s damning, hauntingly provocative final moments. The violent consumption to which Rama falls prey, and the way Evans purposefully denies us a clean ending or easily digestible ‘victory,’ specifically plays with our expectations of the layout and construction of action cinema, leaving its mark by subverting our usual perceptions of heroes, villains, and conflict. It’s the kind of ending that recontextualizes everything that comes before, and pays off thematically in every way possible. The action element of the film is expertly paced too. We have long violent interludes away from Rama in the second act, with a series of characters who prove to be obstacles later on, and while these scenes are utterly invigorating in their choreography and construction in the moment, they take on so much more significance when everything comes together in the finale. In particular, there are two assassin characters – ‘Hammer Girl’ and ‘Baseball Bat Man,’ fighting exactly as described – whose considerable, terrifying abilities and prowess are demonstrated in isolation before running into Rama, and as a result, the stakes feel literally insurmountable when Rama enters into combat with them. When their fight begins, I have no earthly idea how Rama can possibly survive it, and then the sequence itself is constructed to keep those stakes alive and at the forefront throughout. It is a perfect, transcendent convergence of individual sequence construction and overall action movie pacing – and it is ultimately only a little, minor appetizer to what Evans ultimately has up his sleeve in the climactic showdown. Words cannot express the brilliance imbued into each and every action sequence. 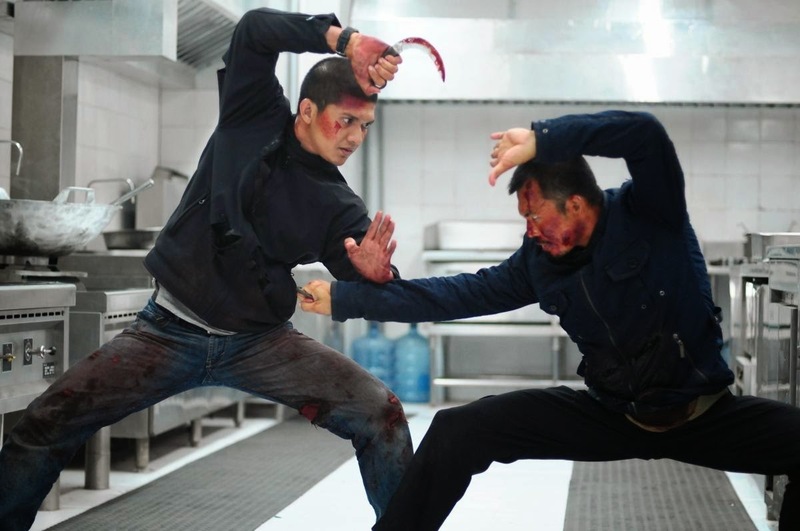 Evans is without peer in this regard, absolutely the most skilled filmmaker working today in constructing, shooting, and choreographing not only fight scenes, but action of any kind, something The Raid 2 solidifies with aplomb. What baffles me is how easy it all looks, how natural every action seems to extend from the character and performer, and how fully earned each successive beat is. These sequences are, of course, meticulously staged, choreographed and rehearsed and executed at such an absurdly high degree that it almost seems inhuman, but it comes across as effortless, allowing the viewer to just get sucked into each sequence, pulled closer and closer to the edge of their seat. The climactic ‘kitchen’ fight is the best action sequence in either Raid movie by a wide margin, a fight so convincingly brutal and endlessly tense that one wonders how the actors came out of it alive, and the way the power balance shifts back and forth over the course of the battle is just awe-inspiring. And as good as the hand-to-hand combat is, there are other kinds of set-pieces here too, with a big third-act car chase easily standing out as one of cinema’s best such sequences. Evans’ employment of violence and bloodshed, meanwhile, is fascinating. Things start out relatively tame, actually, brutal but mostly bloodless, and they expand exponentially from there, until the final few scenes are nauseatingly graphic. It is all part and parcel with the film’s themes; the deeper Rama gets, the more depraved everything is, with each rung up the ladder of corruption not getting him closer to salvation or absolution, but further into an inescapable sphere of carnage and decay. This is not violence for the sake of violence – a criticism I still wouldn’t necessarily argue with being leveled at the original Raid – but violence as an extension and expression of story and character, and it is representative, on the whole, of what a massive leap in ambition The Raid 2 is from the original film. It is probably time we start considering whether star Iko Uwais deserves to be named alongside Jackie Chan and Bruce Lee as one of the martial arts masters of cinema, not only because he is, at this point, unparalleled in terms of physical prowess and choreography genius – he is owed as much praise as Evans for making each fight pop so intensely – but also because he’s improving by leaps and bounds as an actor. Uwais commands the screen here as Rama, projecting inner turmoil expertly and always holding the viewer’s attention when at the center of a scene. His is only one of many fine performances here, though, all of which are exactly what they need to be for each specific part, and one cannot overstate how much each actor’s physicality – whether they are throwing down with their co-stars or not – expertly contributes to the building of character. This is, again, a film I want more time with (and ideally multiple viewings) before nailing down a final analysis. Yet at first flush, The Raid 2 strikes me as a truly great gangster movie, an inspired cross between, say, Takeshi Kitano’s Outrage series (excellent slow-burn gangster politics) and what Evans accomplished on the first Raid (pure action bliss), creating an experience that has many antecedents, but is itself unique, a little unlike any film I have ever seen, regardless of genre, and one which is absolutely worth studying and taking seriously. Know what you are going into before taking the plunge – liking the first Raid is in no way a guarantee of affection for this film – but otherwise, don’t hesitate to seek this one out. We are lucky this film has, miraculously, been given a wide theatrical release – practically unheard of for foreign films these days – and it is not an opportunity viewers will want to squander.